I am involved with professional rocket propulsion in the UK New Space / Alternative Space arena, as well as still maintaining my rocketry involvement with amateur rocket projects and High Power Rocketry. Although the UK New Space / Alternative space community tends to adopt a very low profile, it would be wrong to think that people this side of the pond are going to let Blue Origin, SpaceX, XCOR, Armadillo and Masten in the U.S. have all the fun! Much of the professional rocketry currently has commercial requirements that prevent me from detailing it too much (another reason in my case, I have had to keep a low profile), and in fact, the first 2 projects outlined below were under wraps for a long time, with the projects only being publically unveiled on November the 10th, 2007 at the BIS Space Conference in Glasgow, and the first release of test information in March 2008, followed up by more information at the Farnborough Air Show in July 2008. I have been exceptionally fortunate in being able to work on Project STERN, through Airborne Engineering Limited and in conjunction with Reaction Engines Limited. 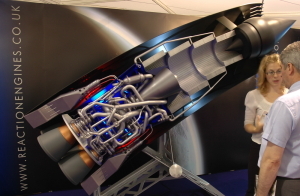 STERN is a rocket engine being developed under the guidance of Alan Bond at Reaction Engines Limited, to provide data for the SABRE propulsion system used for the Skylon spaceplane, which could provide a noticeable increase in performance for Skylon. 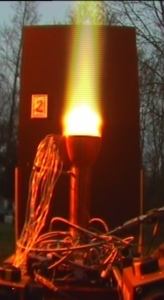 Airborne Engineering was tasked with responsibility for the test programme for the STERN rocket engines, and so far, the collaborative venture of Reaction Engines Limited, Airborne Engineering Limited and Bristol University, have made 12 hot fire tests of the STERN rocket engine, 6 hot fire tests of the calibration rocket engine, and countless cold flow tests and hot fire ignition tests. 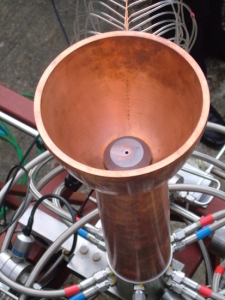 The rocket engine shown, is one of 2 Hydrogen fuelled rocket engines built for the first phase of the test programme. One rocket engine is the actual ED nozzled rocket engine, and the other is a calibration rocket engine. The 2 initial rocket engines are static test rocket engines, and as can be seen, are heavily instrumented with sensors. 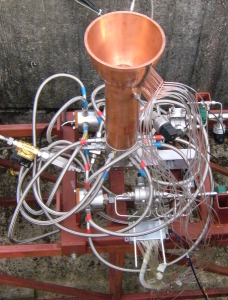 In fact, since this photo, the ED nozzled rocket engine shown in the photo has been covered in a large number of additional sensors. Air breathing, hydrogen fuelled rocket engine projects don't come along every day, and the STERN engine offers some really interesting capabilities to enhance rocket propulsion, most notably, an E-D (Expansion Deflection) nozzle - a rocket nozzle that like an aerospike or plug rocket nozzle, offers advantages of being shorter than conventional rocket nozzles, and being able to compensate fo altitude. Reaction Engines is developing 2 classes of rocket engines; the air breathing rocket engines (Sabre, SCIMITAR and STERN), and the bi-prop rocket engines (SERAPH and SANGRAIL). Because the high pressure reactants move rapidly though the combustion chamber in an air breathing engine such as this, the STERN engine uses an ignition system based on the RZ-20 ignition system which runs on hydrogen and oxygen, providing a very reliable and effective ignition source. As well as investigating the use of ED nozzles for the rocket engines, the static tests to date have also demonstrated just how feasible it is to ignite the the high speed hydrogen / air mix, thus validating yet another aspect of the Sabre engine operations on the Skylon spaceplane. The Rolls-Royce RZ-20 was a liquid hydrogen / liquid oxygen high energy upper stage rocket engine developed as part of the Blue Streak rocket project. The RZ-20 was static fired at Spadeadam in the North of England, before being cancelled. Using an ignition system based on the RZ-20 for the STERN engine, provides continuity from the tremendous work by the previous generation of British rocket engineers. In some respects, an E-D nozzle functions similarly to a bell nozzle, with the exhaust exiting the combustion chamber through a convergent throat region, and then expanding through a shortened bell shaped nozzle. Where an E-D nozzle differs from a bell nozzle however, is that the exhaust flow is deflected radially outwards from the centre of the nozzle by a centre body (known as a plug or a pintle), making the E-D nozzle a radial outflow nozzle as opposed to an aerospike nozzle, which is a radial inflow nozzle. E-D nozzles adapt to ambient conditions through variations in the volume of supersonic flow in the nozzle caused by the action of atmospheric pressure in the wake caused by separation of the flow from the pintle in the centre of the nozzle. Working alongside such talented Rocket Engineers on Project STERN as Alan Bond, Richard Varvill and Simon Feast at Reaction Engines Limited, Mark Hempsell, Dr Neil Taylor, and Helen Webber at the University of Bristol, and my colleagues at Airborne Engineering; James Macfarlane and Andy Elson, has been a tremendous opportunity to increase my knowledge on rocket propulsion, most notably air breathing rocket engines and E-D nozzles. There is very little information on E-D nozzle rocket engines in the main rocketry textbooks such as Sutton and Biblarz, Huzel and Huang, and Humble and Larson, so the work on Project STERN is really interesting in terms of expanding the state of the art. Project Canary is another Reaction Engines / Airborne Engineering project I have been involved with. Canary is a sub-orbital sounding rocket designed to validate various characteristics of the E-D nozzle and aerodynamic features of the SKYLON spaceplane over a wide flight altitude and speed range, most notably for the initial version of Canary, the altitude compensation performance up to Mach 5, including the expansion into supersonic flow and open and closed wake operation of the E-D nozzle. This project is a completely unrelated project to the two previous projects, but evolved from feasibility studies initially carried out in 1993/1994 as part of the proposed joint orbital venture between AspireSpace and ASRI, which was designed to see the use of AusRoc 3 and the proposed Aspire 3 rockets used in an orbital launcher - a cluster of 4 AusRoc 3 liquid propellant boosters would form the first stage, and would be clustered around an Aspire 3 hybrid rocket motor powered second stage, with a solid propellant third stage rocket. Later dusted off, and scaled down for a much smaller UK microsatellite venture, work has been carrying on quietly for a while, to improve the viability of the concept. 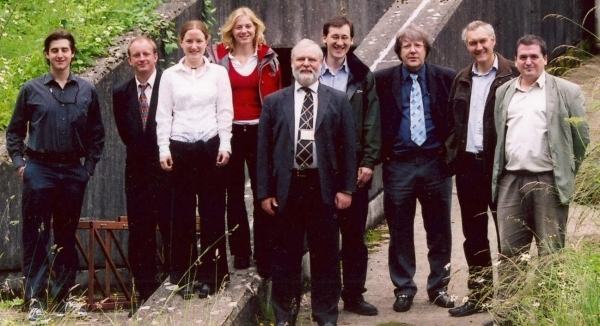 There are a number of other space projects I am involved with that are still in gestation. Hopefully, I'll be able to include these on the website too at some point.